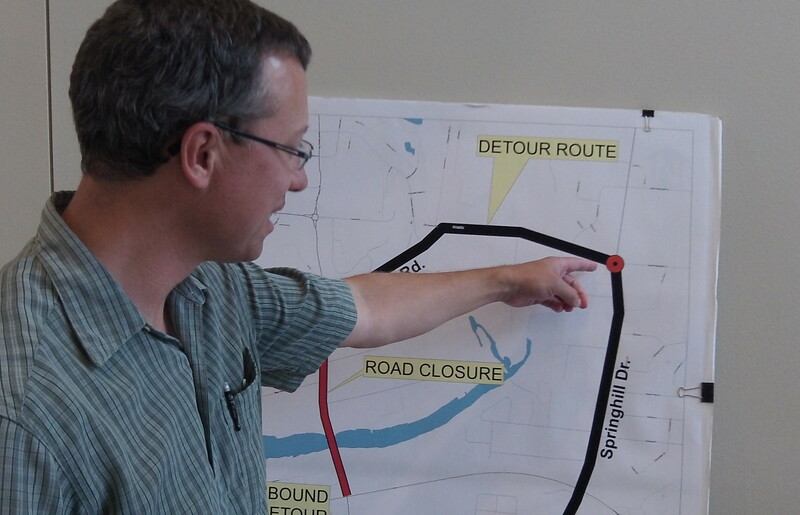 On a detour map, Chris Cerklewski points to the planned roundabout at Spring Hill and Quarry in North Albany. North Albany commuters may be interested to learn that next summer most of them will be negotiating a tricky detour to get to town and back home. That’s because starting in mid-June 2015, according to present plans, a contractor for the city of Albany will rebuild and widen North Albany Road. And traffic on that main access to the district north of the Willamette River will be detoured via Quarry Road and Spring Hill Drive. The intersection of Quarry and Spring Hill as seen from Nebergall Loop at a quiet time Monday night. A joint meeting of the Albany City Council and the Benton County Board of Commissioners got a summary briefing on the project Monday afternoon. Of particular concern: the intersection of Spring Hill and Quarry, where city engineers have plans for a temporary roundabout to handle the additional traffic. Chris Cerklewski, an engineer in Albany Public Works, says the traffic circle will be installed within the existing right of way at the intersection, where the existing pavement is wide enough. There won’t be a landscaped center island so that trucks won’t have trouble getting through. City Councilman Floyd Collins is calling for flaggers to be deployed there and at Quarry and North Albany, at least until drivers get used to the new setup. On Spring Hill at Highway 20, Albany has made arrangements with ODOT for two temporary left-turn lanes on heading into town. But the elevation of the curve in the highway there makes the turn tricky for heavy trucks. For that reason, truck traffic wanting to enter Albany from Spring Hill will be detoured to the highway via Hickory Street and the south end of North Albany Road. The road construction, including aligning West Thornton Lake Drive to a new light at the entrance to North Albany Middle School, will consume much of the summer. Rebuilding the bridge across Thornton Lakes will take 10-11 weeks alone, the briefing was told. Usable parts of the old bridge will be salvaged for use elsewhere. 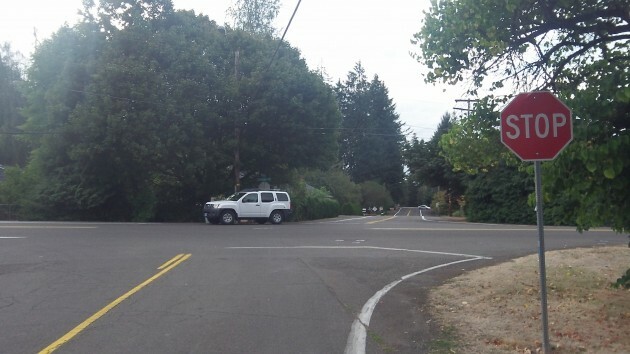 Benton officials noted that at about the same time Albany creates another roundabout (the fourth in town), the county will build one on 53rd Street in Corvallis. The county expects the coincidence to add to the public comments it expects to get. Hmmmmm, really? First, this is not the first time traffic has been detoured using that exact route. Happened at least two times I know of. If the Councilman Collins thinks Albany drivers can’t handle another roundabout, he’s not paying attention. We’re all doing just fine, thanks. We can handle it, Floyd. Even the new Main St. roundabout is functioning well and people have been able to negotiate it without flaggers since it opened. I know ….. amazing, huh? Adequate signage costs far less than flaggers. Save the flagger money and apply it to the new fire station, please.